I am showcasing all of the Fall tablescape posts together. Feel free to visit each one. 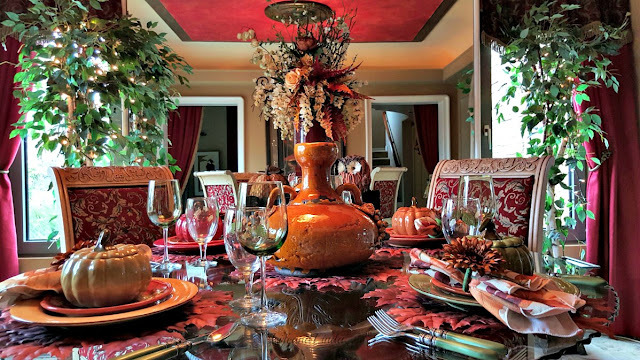 Thanks Linda, for showcasing all the fall tablescapes from the bloghop all together. Isn't it fun to see how they are all different. So many beautiful and inspiring tablescapes. Thanks for sharing Linda. Lots of inspiration! I'm just beginning to allow myself a little bit of fall! Love all of the different fall tables. Sweet of you to show all the beautiful tables. Your table is gorgeous, as always!!! LOVE the copper elements! Linda, so many beautiful table here! Thanks for this post of easy reference. This will be great inspiration. Linda these are all so lovely! Thank you for sharing! I'm so inspired for Thanksgiving!